We give kids extra attention with tailor-made fun just for them. Beaches includes supervised kids programs for five different age levels, and we never charge extra for giving kids the extra special excitement they crave. 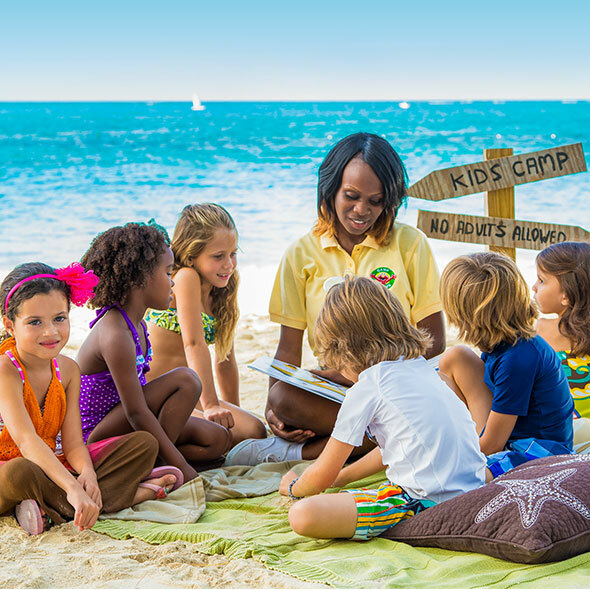 Beaches Kids Camp programs, for infants through age 12, are run by professionally trained child-care experts. But what really sets our family-friendly vacations apart is that our staff is so genuinely caring, your kids will feel like they are in the loving hands of a real family member who wants nothing more than to spoil them. And, with Beaches kids vacations, parents will know that they left their little ones in good, trusting hands. We take care of everything, including your kids, with fully equipped facilities and programs supervised by our highly-trained caregivers. It’s a colorful cast of characters with Elmo, Cookie Monster, Grover, Big Bird, Zoe, Bert and Ernie, Abby Cadabby, The Count, Oscar the Grouch and Julia. The Hot Spot for family vacationing. Guests of all ages can enjoy unlimited play, including cutting-edge Xbox One. Kids at Beaches Ocho Rios who want to take their first shot can enjoy 20 hours of supervised instructions at our nearby golf course. Even kids can learn about the underwater world of the Caribbean, with a variety of PADI® programs.